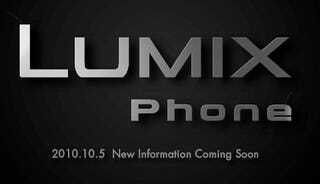 They may not sell many cellphones outside Japan, but considering how well-respected Panasonic's Lumix camera range is around the world, a "Lumix phone" would actually do very well. Given the OS matches up to the phone's awesome-sounding specs, of course. Weirdly, Panasonic's already announced specs for the phone prior to a launch event they're holding next Tuesday in Japan. The phone will edge out Nokia's N8 by one megapixel, supposedly having a 13MP CMOS sensor and their Mobile VenusEngine image processing technology, usually seen in their camera range. A 3.3-inch display with a WVGA resolution, Wi-Fi, DLNA support and the usual features will also be included in this camphone, which is said to weigh 146g and measures 116 x 52 x 17.7mm.